You find calmness while sewing, and take pride in the projects you create, but does your sewing studio give you the same sense of comfort? Koala Studios cabinets are a great addition to your home as well as your creativity, providing a luxurious area for sewing with excellent quality and beauty. Most importantly, Koala Studios Cabinets are custom built for everyone. From the height and color to the storage and surface areas, each Koala Studio cabinet is more than a home for your machine, it's a reflection of you. 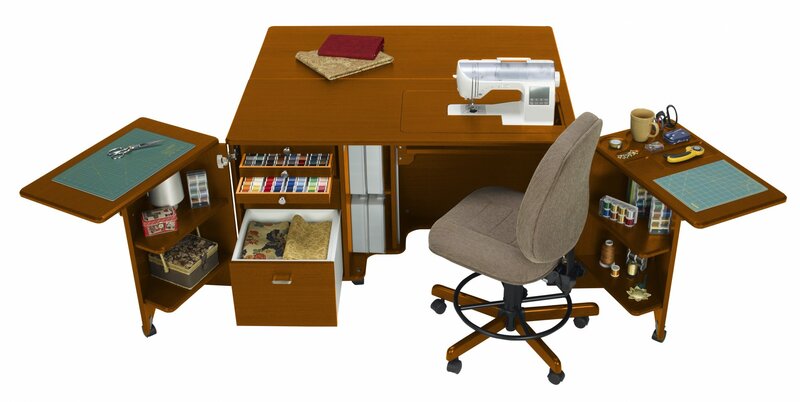 Koala studios are the leading brand of sewing furniture and sold exclusively through the best sewing, quilting and embroidery retailers. Your studio is where you create and we'd love to create a studio just for you. We get that where you sew is a reflection of who you are. That's why each Koala Studio cabinet starts as a base model and then is customized specifically for you and your home's decor. Choose from eight extravagant finishes for your studio. With wood grain ticking and rich color, each studio is as beautiful as it is durable. Every centimeter of your studio – inside and out, including the rounded corners and beveled edges are finished with Koala's exclusive scratch-resistant and water-resistant veneer. Koala studio accessories are also available in all eight polished finishes. Choose the color that best complements your home decor, style, and creativity. Koala Studios are built in the United States with the utmost in craftsmanship and quality. Every detail of your Koala Studio from the environmentally-friendly, highest-grade engineered wood base to the steel components and decorative handles were chosen with quality, elegance and luxury in mind. With all-new state-of-the-art equipment, Koala is able to incorporate advanced and requested design features unique in the sewing industry, including customizing options. Each studio is hand-built by furnishing experts in the heartland of America. When you choose a Koala Studio, you're choosing the highest quality studio that the industry has to offer. That's why all Koala Studios include a limited lifetime warranty as our promise of quality and responsibility for your enjoyment and satisfaction. Koala's lift and platform evenly supports the largest and heaviest machines with a load capacity of 165 lbs. With just the touch of a button, the remote control can stop the machine in any position with no effort or mechanical lift adjustment. In every position, including the top embroidery position, the machine platform will remain solid and steady while evenly supporting your machine. Koala Studios are built with steel components, including a 270 degree heavy gauge door and weight-bearing barrel hinges. You'll also find locking casters with non-marking polyurethane tyres. And they look stunning. Koala drawers feature full-extension steel drawer glides with silent soft-closing hydraulic cushions that prevent drawers from slamming. Each drawer has been weight tested to hold 119 lbs.